Muskegon River offers some of the best fishing for Rainbow Trout, Salmon, Brown Trout year round. 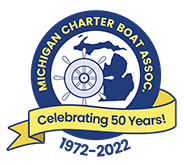 Michigan Charter Boat Association provides a directory of professional Fishing charter captains fishing for Salmon, Lake Trout Steelhead, Browns, Perch. The Muskegon River is a river in the western portion of the lower peninsula of the U.S. state of Michigan. The river has its headwaters in Houghton Lake in Roscommon County, flowing out of the North Bay into neighboring Missaukee County. From there it flows mostly southwest to Muskegon, Michigan, where it empties into Muskegon Lake. Muskegon Lake is connected to Lake Michigan via a mile-long channel. The river has several major branches, such as the Hersey River, Cedar Creek and Little Muskegon River. In recent years the river has gained a certain measure of fame as a recreational fishery, boasting large migratory steelhead, brown trout and planted Pacific salmon.